Home » Category "Season 11"
Right now many experts have selected Phil Phillips as the next American Idol. I’ve seen the sentiment expressed by MJ of mjsbigblog, by IdolBlogLive, by at least one member of each of the Idol Radio Show and FarmvilleRant Radio. And, of course, Dialidol. Intrade still has Phil at 80%. I am not longer convinced that it should be nearly as high. Yes, Dialidol has never been wrong about a finale. But I agree with what people have said: Dialidol has underestimated the Hawaii vote. I also think that within the margin of error, there’s a very good possibility that Dialidol has gotten lucky on the two calls that they’ve made where it wasn’t a landslide. In short, I think I’m saying that it’s close to even odds. Anybody saying otherwise is being overconfident in Phil’s chances, perhaps specifically because of Dialidol. Zabasearch, which does not have great accuracy this year but is OK, has projected Jessica to win. I have no idea how close it was, so I have no idea how confident to be in their results. But as one more indicator, it pushes the needle away from Phil at least a little bit, doesn’t it? 80% is too high for Phil. Maybe Phil has a 60% chance, and no more. The internet pundits seem to be 100% behind Phil, and I think that’s kind of crazy. They did, however, pull her much closer to even with Phil than at the beginning of the night. As such, there is no official Dialidol call, because the difference between the two is within the margin of error. Also note that I believe (not sure) that Dialidol should have left the poll open for another hour. 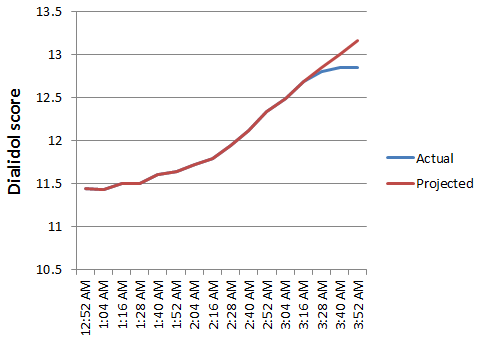 However, at the rate measured at 4:00 AM, that would not have changed the fact that Phil would be on top. Some people think that Phil being ahead on Dialidol is dispositive, but I’m not so sure. We saw just last week that Jessica’s votes were at least slightly undercounted compared with Joshua’s. The question is how big this effect is. We know that she’s being undercounted by at least 0.3 points. But could she be undercounted by 1.4? We don’t really know, but it could be. Much has been made of Dialidol’s accuracy, but many of their calls are outside the margin of error. 2 out of 7 were too close to call. Yes, Dialidol ranked the winner #1 in both of those cases, but they had a 1 in 4 chance of that happening by random guess. Meanwhile, Intrade’s estimate for Phil winning dropped from 90% to 80%, which is where I thought it ought to be. Also, you can read Votefair’s official explanation for why it’s OK that Jessica has led every poll for the year. I’m not sure I find it entirely convincing. He says that he is controlling for votes from the Philippines. But what about votes from Asian Americans? It’s not like he can IP filter those. Votefair is a self-selecting poll, and there are lots of potential problems with that. I still lean toward Phil being the winner, but there isn’t enough information right now. UPDATE 2: Ok, I am going to bed. This is ridiculous. 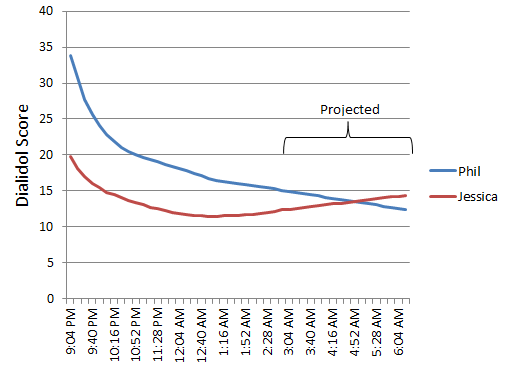 According to my projection, Jessica will overtake Phil in about an hour, 4:30 AM eastern. If that happens, well, you’re going to see a post here tomorrow morning that says I think Jessica Sanchez will win. UPDATE: The effect is accelerating for Jessica Sanchez. To look at this, it appears that she will overtake Phil Phillips before the voting closes. Wow. I’ve updated the graph from my original post to reflect the change. Original post: In between about 1 and 2 am tonight, the gap between Phil and Jessica on Dialidol narrowed from 16.477/11.431 to 16.119/11.543, or a change of about half a point. Looking at the DIHardGraphs, Jessica’s voters might be doing it. (Times are all eastern time zone, times beyond 2:30 AM are projected by me) If Jessica can maintain the pace (that is a big if), her supporters can barely squeak her into the lead by the time Hawaii’s voting closes, I think. Now, if a majority of those votes come from California, it won’t happen, because their voting will close off. But if more from Hawaii replace them, they might be able to squeak by. The early returns from WNTS have been posted, and the contestants had an average score that was equal to within a rounding error (53). The proprietors over there say that it was neck-and-neck, but that the performances were perfunctory because people have already made up their minds. Fair enough, that might be. But if anybody was going to be swayed, I do not think it would be in Jessica’s direction. Her rendition of the truly execrable Idol song “Change Nothing” scored a 26, tied for 6th worst of any performance during a finale. Phil’s version of “Stand By Me” was also panned, but does not rank in the top 10 worst finale performance polled by that service. With near-rave reviews of his Idol song, Phil would perhaps be at an advantage if any was to be had. Dialidol, which I’ll remind you has not yet missed a call in 7 years of finales, has Jessica trailing badly in all metrics (Dialidol score, raw votes, and busy signals). As of right now, she’s being trounced. California can help her, but they will need to get busy. She may pick up some of Joshua’s votes, but there is no evidence that she has so far. The current slope in the DIHardGraphs show no flagging of Phil’s support. The voting closes at 1am on the east coast, so maybe after that she can pick up some steam. Intrade, the betting market where people buy and sell “stock” in a given outcome, has Phil at a 90% probability of winning. That is the same probability they had Barack Obama at on Nov 3, 2008, an election whose outcome was more or less assumed. I happen to think that giving Jessica only a 10% chance is a bit low. My feeling is that it’s more like 80% to 20% in Phil’s favor. That’s Votefair’s results for the Top 7. She had 2.6 times as many votes as Phil that week on Votefair. You know who actually had more votes than Jessica? Phil, Joshua, Skylar, Colton, Hollie, and yes, even Elise. She was dead last. What would be the point of crunching numbers? There isn’t currently any single substantive reason to think that Phil will not win. Squinting at data trying to see a given result is something that we’ve all been guilty of, but no amount of squinting is going to reveal a probable Jessica win. It would be a major upset, though I might stop short of saying a shocking upset. Yes, upsets happen. The US beat the Russians in hockey at the 1980 Winter Olympics. Buster Douglas beat Mike Tyson. The Patriots beat the Rams after bringing a 6th round draft pick as their quarterback mid-season. Anything can happen, I suppose. But this isn’t where the smart money is.